I don’t actually know how it’s the end of September already? I feel like the first half of the year went really slowly and now it’s going at warp speed. Dare I say, you can almost hear the jingle bells around the corner…..too soon? 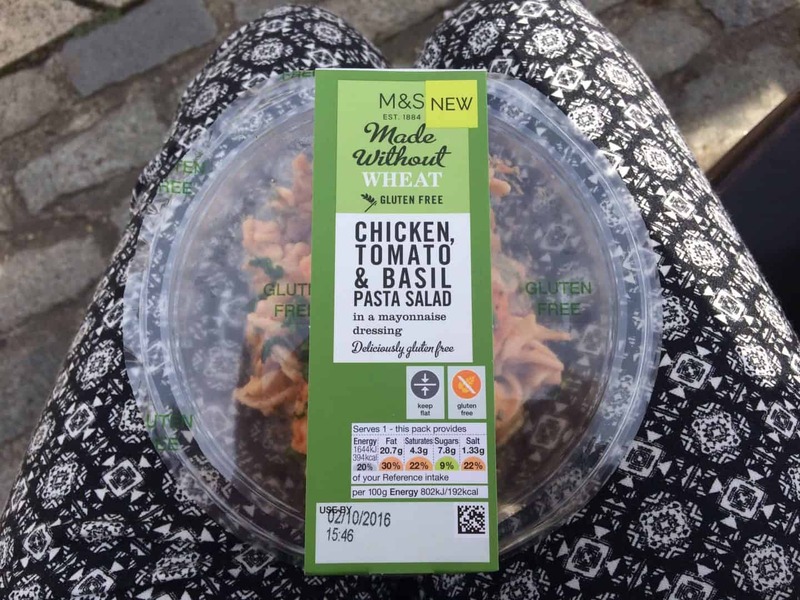 Marks and Spencer have added loads of new lunch options to their Made Without Wheat range this month – great news for us coeliacs who struggle to grab a gluten free lunch on-the-go. They have two new gluten free pasta salads: Chicken, tomato and basil gluten free pasta salad and the gluten free feta, tomato and orzo pasta salad. They have also added some new sandwiches to their range which I have been enjoying – the roast chicken salad and the prawn mayonnaise. I really like their bread, it’s not too dry and the sandwiches have a good amount of filling – though I would have liked a bit of salad in the prawn one! I have tried the chicken pasta salad which was nice, pretty standard to how I remember pasta salads being – the orzo one looked kind of soggy so I gave it a miss. I think I might be a little bit addicted to these! I picked these up in my gluten free Aldi haul, but I have seen them in Tesco too. They are SO scrummy – they are made with pea but they remind me of Chipsticks! It’s really nice to have a gluten free snack with this texture – most of them are wheat based – and better than crisps. You have to try them! I’ve never had a profiterole before, so when Rule of Crumb sent me some goodies to try I was very to see these in the box! They come with about 16 in a box (if I remember correctly!) and both a caramel and chocolate sauce. They are so yummy, filled with deliciously sweet cream, and I can see what people love them so much. I’d like to try the Tesco version as well for comparison, but I’d definitely buy these again! Tesco free from scampi is back! There was SO much excitement when Tesco’s free from scampi landed in the freezers, but it seems to have disappeared for a while. I’m pleased to see that after some months, this gluten free, wheat free scampi is now back, hurrah! Several supermarkets are bringing out more fresh gluten free options, but Morrisons led the way this week with the introduction of their chilled Whole Creations pizzas. My local store had gluten free margarita, pepperoni and a cheesy pizza garlic bread. These were all really yummy – the garlic bread was something I hadn’t tried before and made a good sharing side with our meal one night. Loved it! 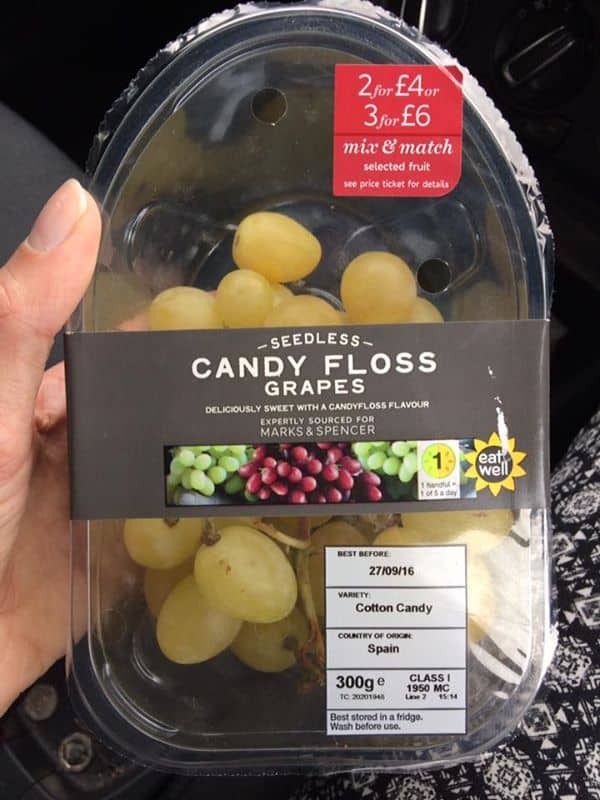 Ok, so I know grapes are gluten free ANYWAY, but you have to try these candyfloss grapes. 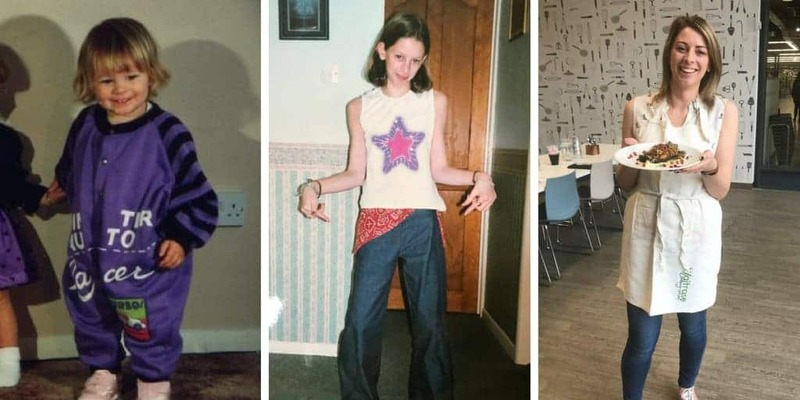 Coeliac, non-coeliac, I don’t care – just eat them! They are so sweet and juicy and I’ve spent far too much money scoffing my way through punnets of them, but they are worth a try for a yummy snack that’s better than sweets! I had to visit Norwich on a work trip (that’s where I am writing this from!) and managed to meet up with one of my old uni friends, Lauren. We went for a meal at Côte Brasserie as it was recommended highly as being good for gluten free. I wasn’t disappointed! 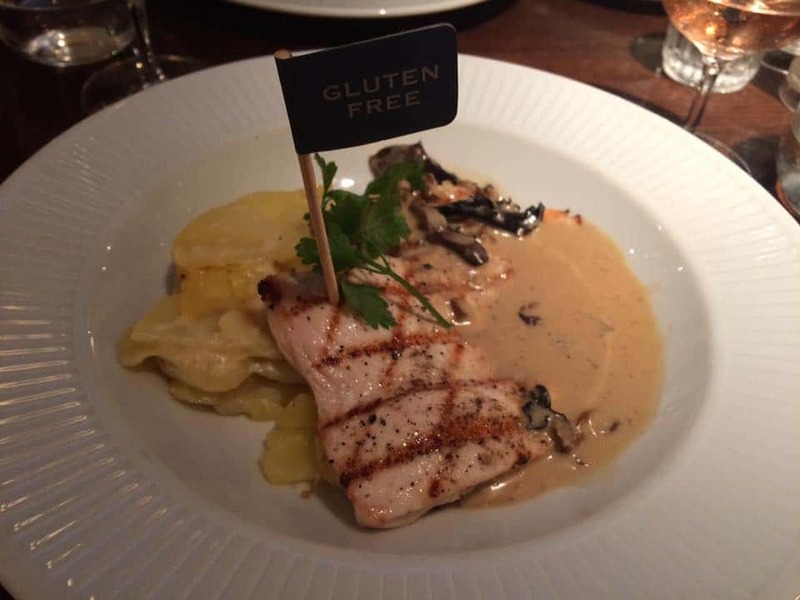 It was a beautiful restaurant and they had a large gluten free menu which was accredited by Coeliac UK. 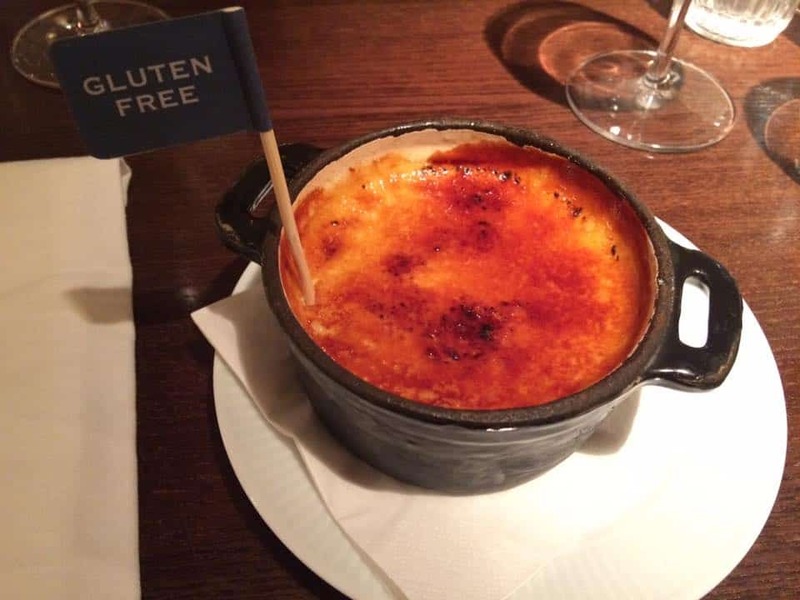 I had Poulet Grille for my main, followed by a Creme Brûlée – it was amazing and I loved the little gluten free flags in my food too! There are probably LOADS more yummy gluten free goodies I’ve tried this month but I’m running out of time before my flight home! What have been your favourite gluten free products? Comment below and share your September favourites! Oh boy….note to self, don’t read Sarah’s blog when hungry! These finds are awesome. 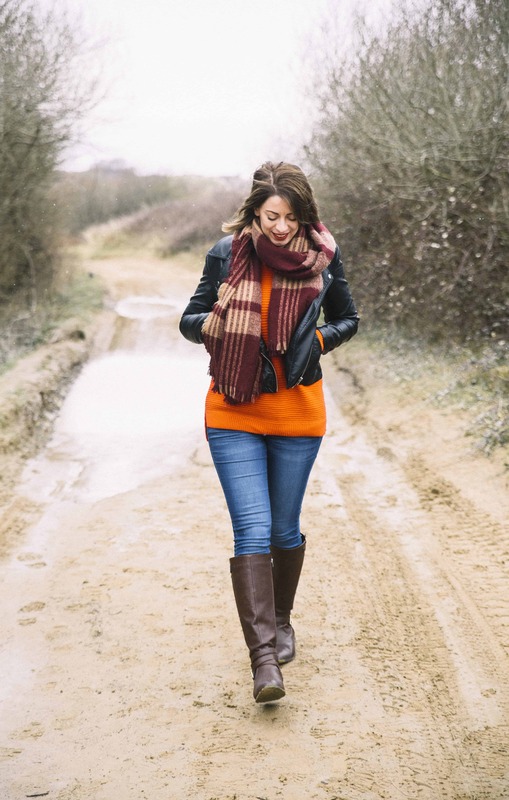 Now I’m following a FreeFrom diet like my daughter I realise I’d been walking around with my eyes shut. I’d started to shop as if I was Bethany, only looking at products Bethany would like. I on the other hand love all food so I’m bringing stuff home that Beth wouldn’t have entertained….but!….she’s starting to show an interest. Don’t know why I developed a food intolerance sooner…how’s that for positive thinking!!!! !